Marjorie and Edward Stewart were members of Winscombe BC. E.M. Stewart was in fact Captain of Winscombe in 1947 and 1948. They moved to Exemouth in 1949 and joined the Madeira Club. 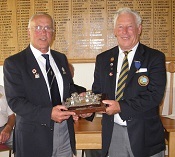 An Annual fixture between Madeira and Winscombe was arranged on a bi-annual home and away basis. This is a Triples match across 6 rinks played over 21 ends. As part of the Presentation ceremony tradition requires the Home Captain to ask members to stand and he reads from a script written by Marjorie back in 1950.
" no I am a fraud really, I dont want to play just to have a look around. You see when I was a young lad I spent many hours here watching my dad play bowls. " Further enquiry discovered he was 'Bruce Stewart' and a look in the Club's Archives revealed that his dad was E. M Stewart and his mother Marjorie Stewart. Bruce now lives in the village again and we intend to ensure he presents the trophy in the near future.